Single Roses – Dig Delve – An online magazine about gardens, landscape, growing & making. It is that time again, a relay of one spectacle running into the next. In the hedgerows the hawthorns burst and spilled in Hockneyesque flurries, dimming only for a moment before being replaced by guelder rose and now the first of the elder with its creamy tiers piled high. 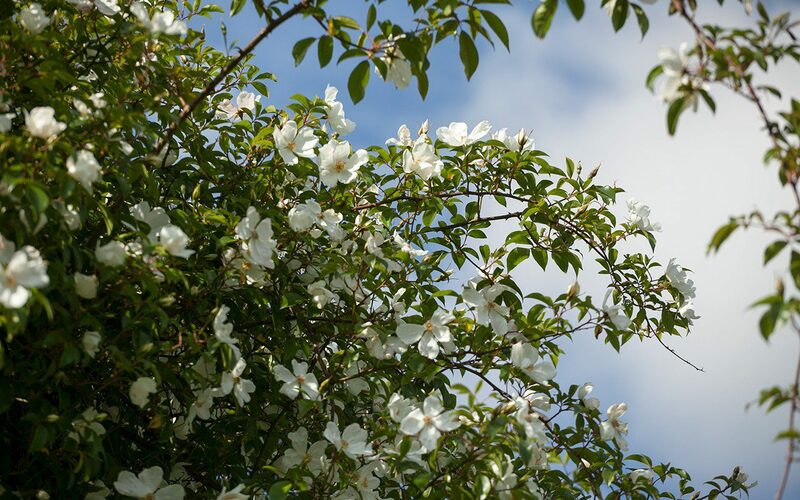 In the garden, where we are working towards a similar principle of massed succession, the Rosa ‘Cooperi’ has helped us to connect to these whites in the landscape and jump the boundaries, so that your eye can travel a distance. First close up and then out, to leap from hedgerow to hillside. I first saw Rosa ‘Cooperi’ about twenty years ago when I was judging the open gardens of Islington. It was love at first sight and I asked for and came away with a cutting, which rooted readily and took over the wall at the end of the garden in Peckham. It grew there vigorously and now I smart to think what the current owners must be dealing with, because this is a rose that needs headroom. 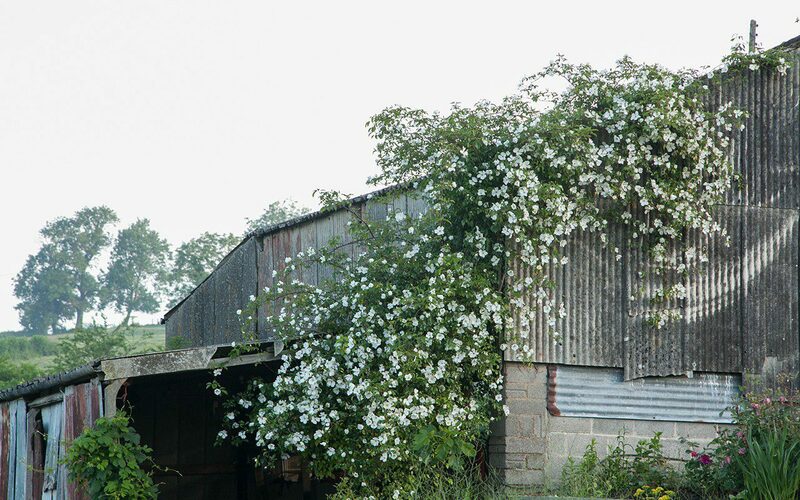 A cutting was dutifully brought to Hillside where I released it onto the old barns (main image) and, seven years later, it is showing not a sign of slowing. Its limbs, reaching continually out and away from the last year’s extension growth, can easily make three to four metres in a season, though it is said to reach no more than ten. As the best flowering wood is the previous year’s, it makes sense to let it advance without curbing it too vigorously, and so it clouds and softens the building’s outline. I keep it from overwhelming the barn – for it has made its way inside as well as out – by cutting back the excess of viciously thorned limbs in winter. You have to tie down your hat, or it will be whipped from your head, and wear tough clothing, never a jumper, which will be laddered and have you snared in moments. Wrangling aside, the dark, glossy foliage is the perfect foil for a succession of simple, ivory flowers that this year smattered in the last week of May and were at their zenith last weekend when these photographs were taken. In form they are as pure as dog roses, but twice the size, becoming speckled pink if they get rained upon and as they age. The display lasts three weeks reliably, a month if you are lucky, but I never complain about this brevity. In fact, there are two glossy cuttings waiting in my holding area for somewhere to release them into grass. I’d like to see how ‘Cooper’s Burmese’ would take to not having anywhere to climb. I have a hunch it might mound and then stop its advance with nowhere to go, so in long grass on a bank I could simply edit its longest limbs from a sensible distance with long-armed pruners. We have removed all the double David Austin roses from the garden and made a cutting area where they sit in sensible rows with dahlias and cutting peonies. Their opulence is wonderful in a vase, but not where I want things to feel on the wild side. 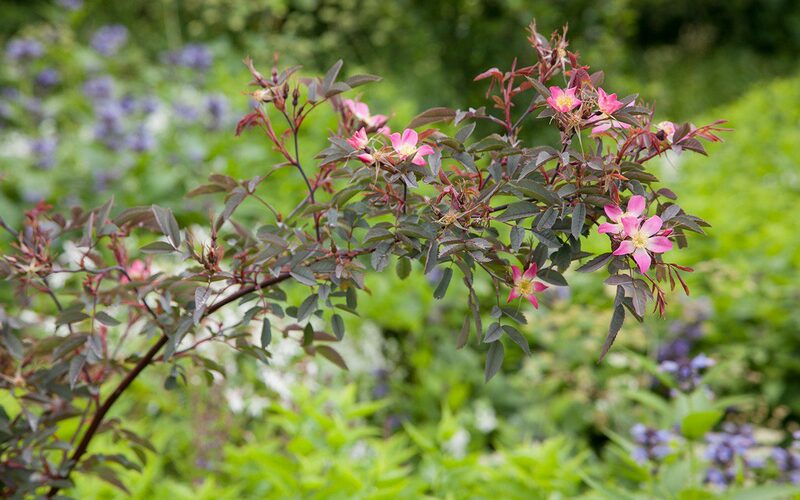 Instead, Rosa glauca has made its way into the perennial planting, Its young coppery foliage ages to a completely matt grey-green as June gives way to full summer and it makes a delectable background, arching elegantly and scattering tiny, perfectly formed, pink dog roses along its limbs, which become mahogany-dark hips in autumn. I love it and am pleased to have it back after not having the room when gardening in London. If left untouched it will form a loose bumound of six foot in all directions. 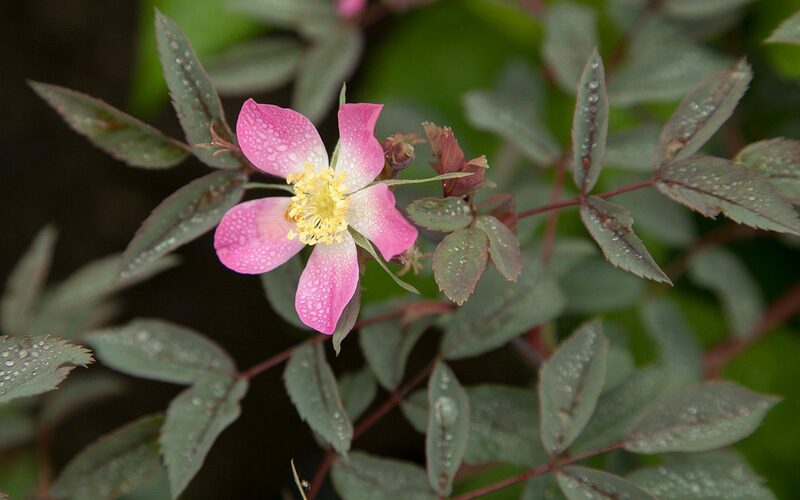 However, it can be coppiced hard every third or fourth year for the benefit of new, strongly coloured foliage, although you will have to wait a year before it starts to flower again. The last time I grew Rosa ‘Scharlachglut’ was at Home Farm, where it spilled through the gold-flowered oat grass, Stipa gigantea, in the Barn Garden. 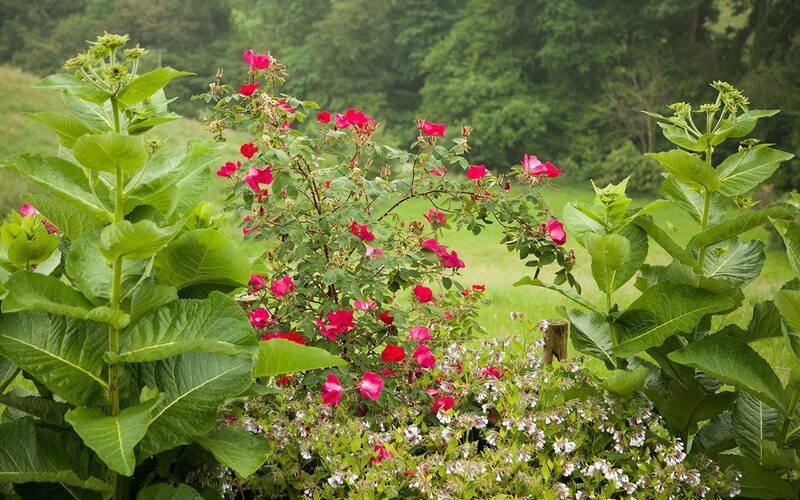 Cultivated roses and grasses make curious bedfellows in the borders, but the singles sit well with informality. The colour in the enclosed space of the Barn Garden was deliberately provocative and you could feel the race of your pulse when the reds and pinks came together. ‘Scharlachglut’ means ‘Scarlet Blaze’ (it is sometimes sold as ‘Scarlet Fire’) and, true to its name, it flames fiercely against the green in the landscape here, but I am delighted to see it unapologetically announcing summer. Though once blooming – as are its companions above – its brevity is remarkable. Scarlet, perfectly shaped buds open bright vermilion and age to a hot, cerise pink so that a range of colour appears along the length of arching limbs. As the flowers age they also increase in size and, although perfume is not its greatest strength, no matter, its presence is astonishing. Though I currently have it growing through comfrey and inula for later, as the planting matures I will add cow parsley so that the scarlet is suspended in cooling white. The timing is at the point of crossover where the lace of the anthriscus is dimming. When the cow parsley is over they will both be gone. 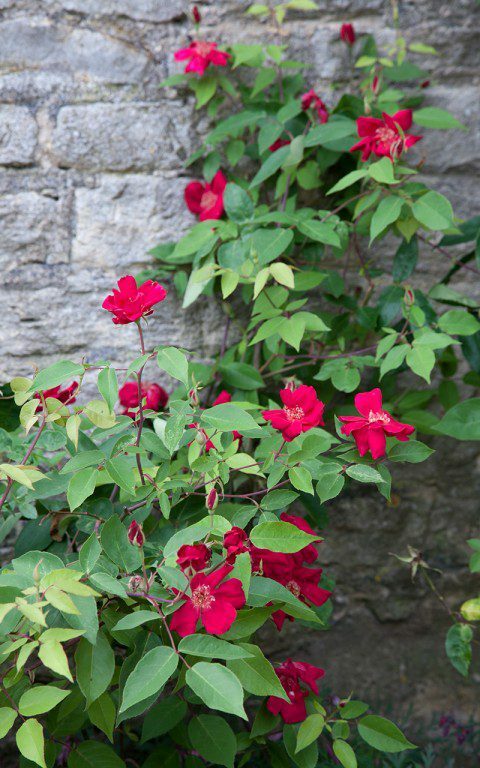 Up by the house, and the only recurrent rose in this collection, is Rosa x odorata ‘Bengal Crimson’. Once again, this is a cutting from the garden in Peckham, where my original plant will be presenting less of a problem to its owners. Rosie Atkins gave me the mother plant when she was the curator at The Chelsea Physic Garden. It grows there in several places, spilling informally from the borders, for it is almost impossible to prune. The growth is soft and thornless, the limbs reaching whichever way they choose to go, but forming something lovely despite the lax behaviour. Being slightly tender, it loves London living and will easily grow to two metres or more in each direction against a wall, or taller with support in a sheltered position. It hated life here initially and my young cutting burned and frazzled where it was exposed in its windy holding position. I have now found it a sheltered corner in the lea of the house where it looks like it ought to. 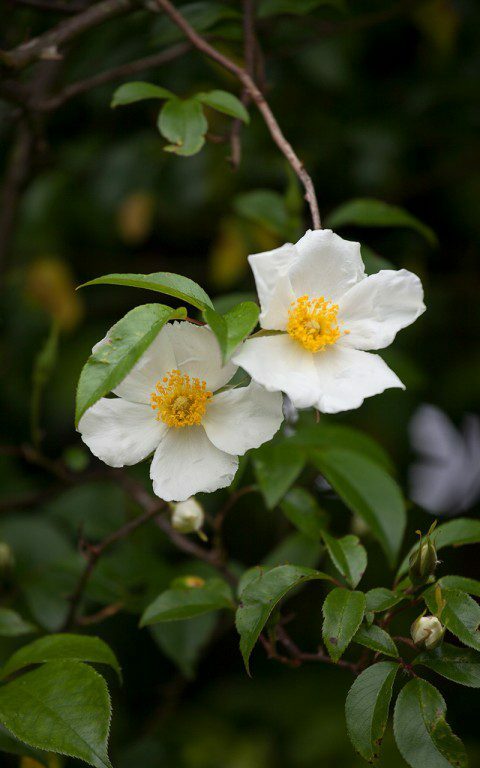 Soft and choice, with pale, apple-green foliage and flowers that refuse to conform to order. 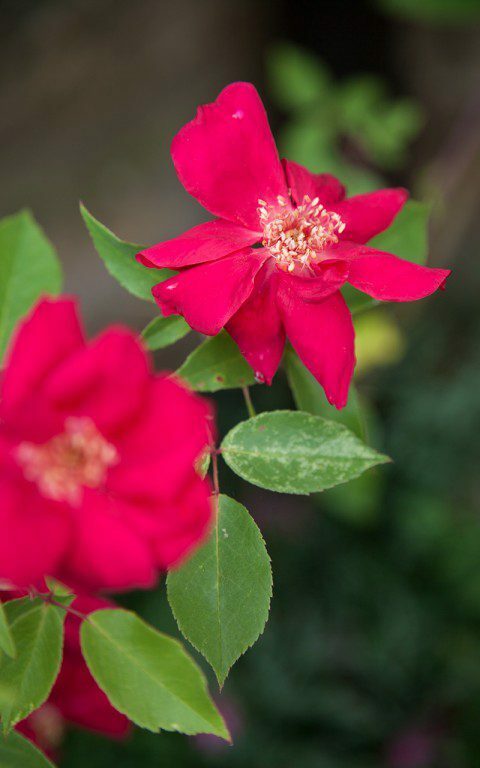 Opening from perfect buds of crimson intensity, the single flowers rarely open completely, but fold and roll informally, fading so that they too have variance when they come together. As they do, one after another without pausing, until winter curtails the willingness to throw out more growth. That said, it is often in flower at Christmas, although by then the flowers are chilled to a softer pink. 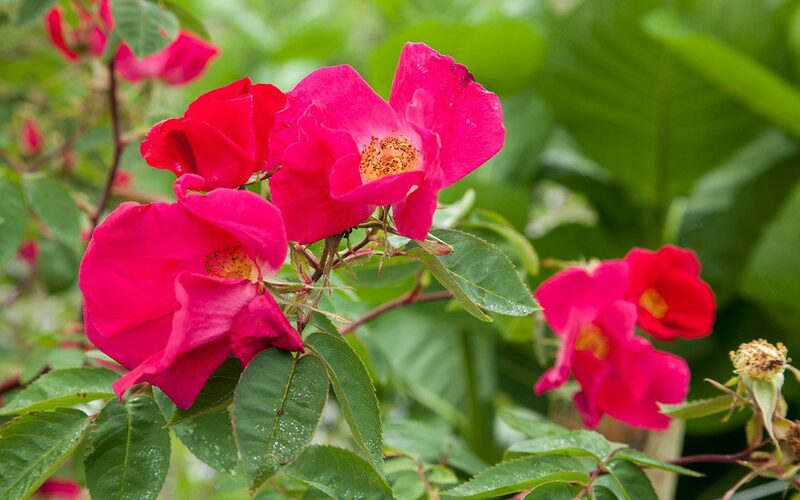 With a plant that is always so giving, it is important to repay it with the care of deadheading by taking the spent sprays back to fresh new growth. In doing so, you can give it just the amount of attention it needs to keep the plant looking good and, after a brief pause, it will respond with more flower. A simple exchange, and an opportunity to spend some time up close with this beauty.